Dirty South superstars live up to their album's title with the help of a gang of P. Diddy-paid producers. 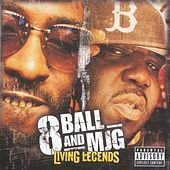 8Ball and MJG don't waste time, kicking off with "You Don't Want Drama," the most menacing rap single since Three 6 Mafia scared everybody a couple years ago. The totally awesome "We Do It" drops right behind it. 2004 Bad Boy Records Inc.